Question: What area of the UK do you cover? Answer: We cover from Oxford, Oxfordshire to Dover, Kent and Peterborough, Cambridgeshire to Portsmouth in Hampshire so quite a large area. The counties we cover are: Kent, East & West Sussex, Surrey, Essex, Herts, Hants, Oxon, Berks, Bucks and the whole of Greater London. 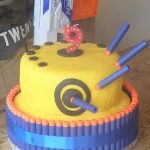 Question: How long should I book in advance to secure my Blaster Party? Answer: We are currently 12/16 weeks in advance so book early to avoid disappointment. 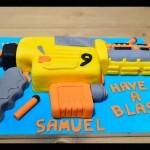 Question: How many children do I need to arrange my Blaster Party? 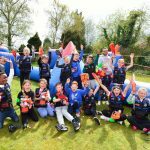 Answer: The minimum number of children or adults required is 15 for any Party whether indoors or outdoors, at our venue or a venue of your choice. 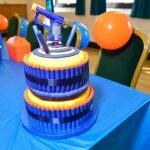 (RIVAL or Traditional Blaster fun) If your party is outside our area of travel we can agree a mileage subsidiary or agree a higher number of persons to conduct your party regardless of travel. 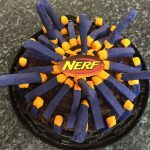 Question: How much space do I need to conduct my NERF Party indoors? Answer: This depends on two factors, the number of children/adults attending and how old they are. For the minimum requirement of 15 children/adults you need a space of at least one Badminton Court in size preferably two. 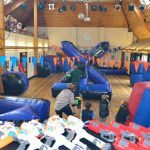 (Half a Sports Hall (22m x 12m) is ideal if less than 25 children) If you book a Community Hall or Village Hall then again at least one badminton Court in size (18m x 10m) for 15 children and if it has a stage then even better for our huge armoury. 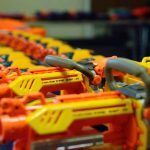 (200+ blasters) A standard Party is normally on average 15-50 children/adults indoors. Question: How much space do I need to conduct my Blaster Party outdoors and on what type of surface? Answer: Outdoor Blaster Parties are only limited in size by the space offered and the numbers of children/adults present. We can set-up outdoors on any flat, short cut grass/astroturf area as long as it is dry with no mud or wet areas. 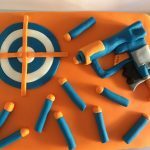 Space required for outdoor Blaster Parties/events are at least 25m long x 15m wide with space around the outside of at least 10m for NERF Dart/Ball fly-off. (for safety reasons) For example: 30+ children would need an area of 30m x 20m plus 10m all the way around for NERF Dart/Ball fly-off. Question: How much time should I book our Sports Hall for? 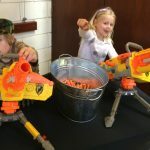 Answer: You need a four hour window, 1.15hrs to set-up, 1.5hrs of NERF fun, 1.15hrs to dismantle, while we dismantle our blaster arena you can have your party food. Question: Can you play in the rain or on wet/soft ground? Question: What safety measures are in place to protect children’s/adults eyes? Answer: We take safety very seriously and supply googles/glasses or Full Face Masks to every person before playing blaster games in our arenas. If anyone does not take these safety measures to hand then they cannot play games safely in our company. 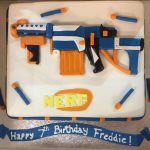 Question: What is the minimum age required for my children to have a Blaster Party? 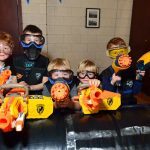 Answer: Our minimum age restriction for children to participate in blaster related games and fun without parental supervision is 6 years old. No children under the age of 6 can play in our combat arenas. 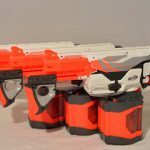 Question: What is included in our Blaster Party fee? Answer: Everything from a combat inflatable bunker arena, PA system with mega music, 200+ Blasters to play with, foam darts or balls supplied, jackets, goggles/face masks, foam ball hand-grenades, prizes and medals for game winners, MBW certificates and NERF darts for all, a NERF blaster present for one birthday boy or girl, a gold medal for leadership for the birthday boy or girl. In addition to this, outdoor blaster Parties get smoke bombs for added effect. Question: Do you do Corporate events for businesses? 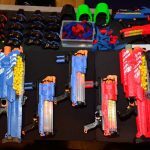 Answer: YES we do blaster events for both Traditional & RIVAL blasters in both fun aspects and tournament formats. Inter-company and inter-school tournaments a speciality. PTA Fairs always catered for. 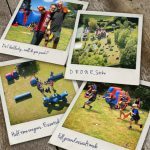 We also cover Stag & Hen Parties with RIVAL, so no pain, mess or costs like Paintball but very similar fun and especially no welts!